I feel like I’m not a great cook any more. I’m not horrible, but I feel like I’ve lost the patience necessary to be a tremendous cook. Almost daily I thank my lucky stars that I elected not to do a blog exclusively about cooking. Because some of my most recent failures would not offer a compelling read, unless my blog was entitled Cooking Blunders. It was such a nice try on his part, but the truth is Food Network would call it a cooking fail. The recipe was simple. Tiny new potatoes, fresh green beans, sliced pieces of Italian sausage, seasoning, all doused in olive oil and put into a piece of aluminum foil. The foil was closed up to make a package, and cooked for 30 minutes on the grill. Easy, right? Except that I should have double wrapped it in the foil because it cooked fine on the closed side. However, I turned it so that the part that I had allegedly pinched closed was on the bottom, and unfortunately, it really wasn’t closed. At least not tightly enough. As a result, the olive oil dripped onto the grill and a rather large fire ensued. A fire of which I was entirely unaware because I was engrossed in a book. I was reminded of a simply hilarious episode of the Bob Newhart Show in which Bob was grilling steaks on his Chicago condo’s patio and unbeknownst to him, the steaks caught fire. Bob was in his living room doing all of the funny conversational things of which Bob Newhart is the master, and in the background the audience watched as the grill was consumed by flames. Here’s an interesting fact about moi. I am easily influenced by reading what someone in a book is eating. So if I read a book that takes place in India, I crave Indian food. If Mexican food is mentioned, that’s what I want for dinner. It happens the book that I’m reading (in which I was so engrossed and totally missed out on a grill fire which rivaled the Great Chicago Fire of 1871, minus Mrs. O’Leary’s cow) takes place in Scotland, and the characters routinely eat scones. 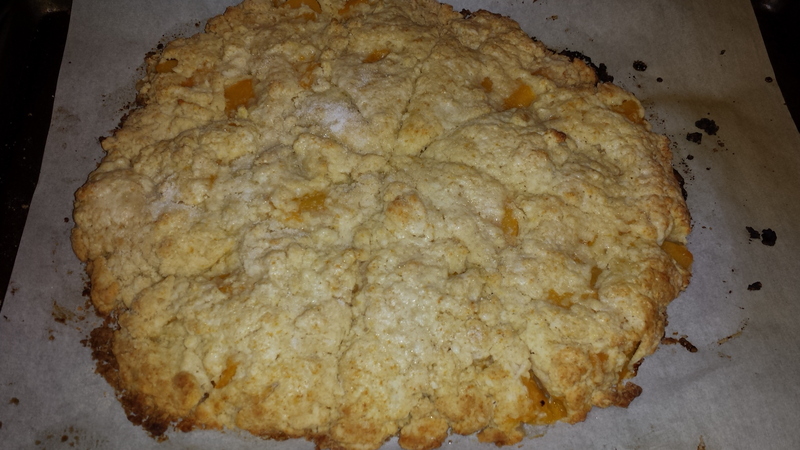 So I made my own peach scones. Had I shot video of my endeavor, it would not have made the cut on Next Food Network Star. Perhaps on America’s Worst Cooks. Ina Garten makes the process of making scones look easy (using peaches imported from a small organic and sustainable peach grove in the south of France). She ends up with a beautiful disk of dough that she easily cuts into triangles and bakes until they are a golden brown with sugar crystals glistening on top. I, on the other hand, ended up with a crumbly mess that I pressed into roughly a round disk, all the while frantically patting the crumbs back into the dough. But it didn’t turn out too bad…..
And when it was all said and done, the scones were quite delicious, as evidenced by Bill eating two in a row. Just as an aside, when I’m cooking, Ina Garten often comes to mind. Mostly how she would be horrified to observe me in the kitchen. 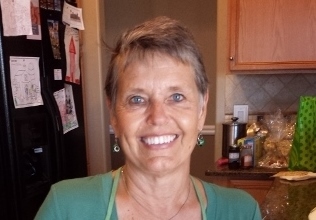 For example, I thought of her recently when I was making chicken. I had seasoned the chicken, and needed to throw something away. Because I had not yet washed my hands (which were full of whatever it was that I wanted to toss) and didn’t want to touch anything with raw chicken still lurking there, I opened the cabinet door with my feet. While doing so, a couple of thoughts came into my mind: 1) I have never seen Ina Garten open a cabinet with her feet; and 2) I wonder if it is any more sanitary to put your feet on the kitchen cabinet handle than using chicken-laced hands. Don’t worry, I used an antibacterial cloth to wipe the handle. 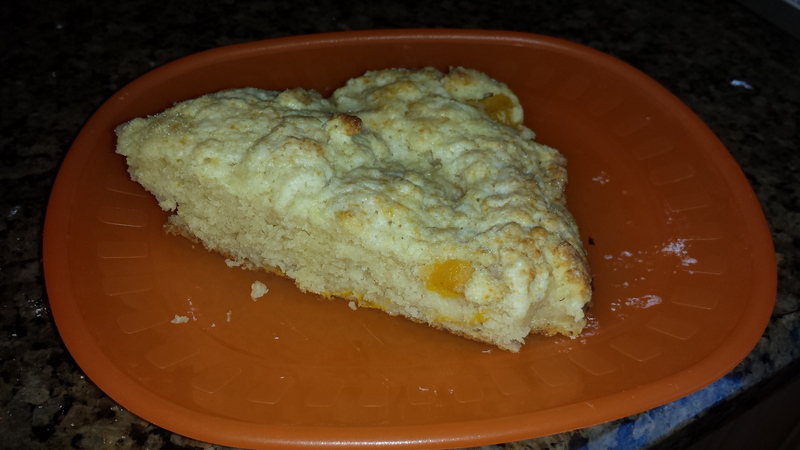 Here is the recipe for the peach scones. Despite the crumbly dough, the scones were delicious. Whisk together heavy cream, sour cream, egg, and vanilla extract. Slowly add the wet ingredients into the dry ingredients and mix until just combined. On a well-floured surface, turn out the scone dough and pat into a small disk that’s about a half inch thick. Cut into 6-8 slices, and transfer to the baking sheet. Brush each scone with just a bit of heavy cream. Nana’s Notes: Her recipe had a glaze; I chose to sprinkle mine liberally with sugar after brushing on the cream. Also, since I was facing the above-mentioned crumbly mess, I formed my disk right on the baking sheet, and that seemed to work fine. Finally, I didn’t use fresh peaches; instead, I used canned. That made the dough a bit wetter and the resulting scones a bit more moist. I’m not sure if that’s a good thing or a bad thing.